Hwang Min Hyun is a member of NU’EST from Pledis Entertainment and a member of WANNA ONE from YMC Entertainment. He was on the show, “Produce 101 Season 2” and was chosen to be part of the new group “WANNA ONE”. WANNA ONE is under the label YMC Entertainment, just as IOI was before they ended the group not too long ago. And if you didn’t know, the winners of Produce 101 Season 1 were the members of IOI. 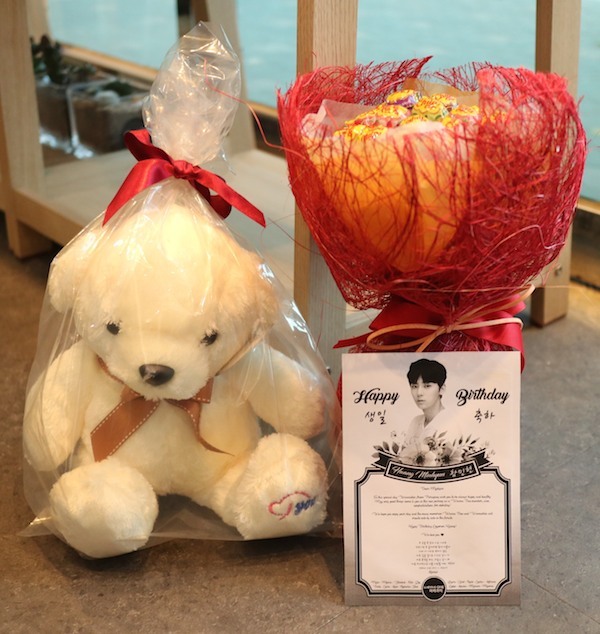 It was Hwang MinHyun’s birthday not too long ago, so we had some fans place orders with Flower Gift Korea. There were a bunch of different groups of fans who got together to think of which gifts to send to Hwang Min Hyun in Seoul, South Korea. 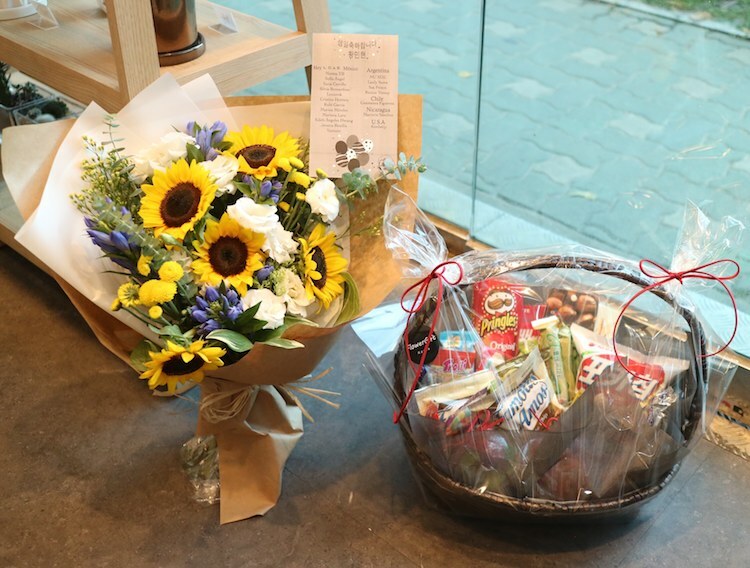 In the end, they decided on which Flower Gift Korea items to send Hwang MinHyun as birthday gifts. 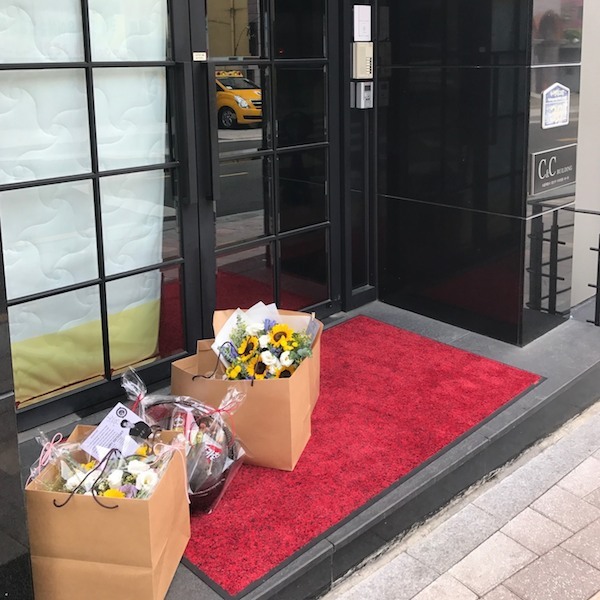 And we were lucky enough to get some photos of our delivery to YMC Entertainment, which is located in Seoul, South Korea. The above three photos show what we delivered to YMC Entertainment, Seoul, South Korea. It was our first time to YMC Entertainment that time, so we weren’t sure how strict they were going to be. 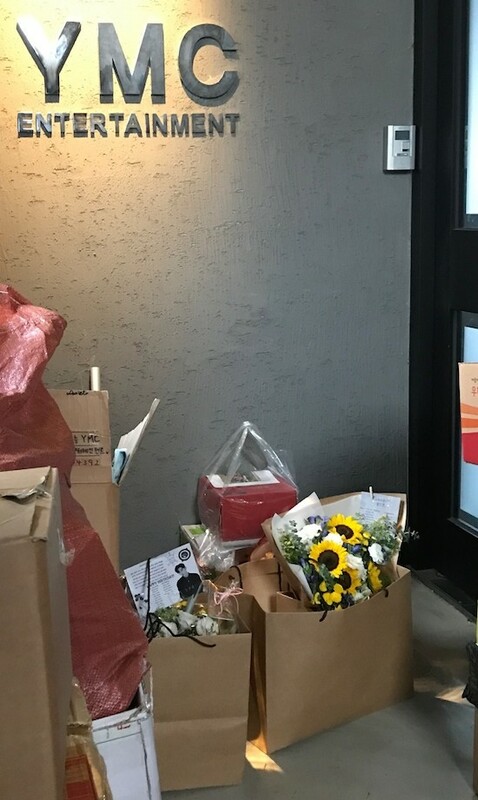 And it wasn’t easy to get the delivery there because YMC Entertainment is located inside a building that doesn’t let anyone in without approval from a worker. Outside of the building where YMC Entertainment is located in. It wasn’t easy for our delivery man to get into the building. But after trying a bunch of few things, we were able to get into the building! So the above photo is of the gifts inside the building. Nice! We got into the building, so now we had to see if we would be able to get to YMC Entertainment’s door. Once we got to the fourth floor, we knew we were in the right place because of all of the boxes that were there for Hwang Minhyun from other fans. Wow! 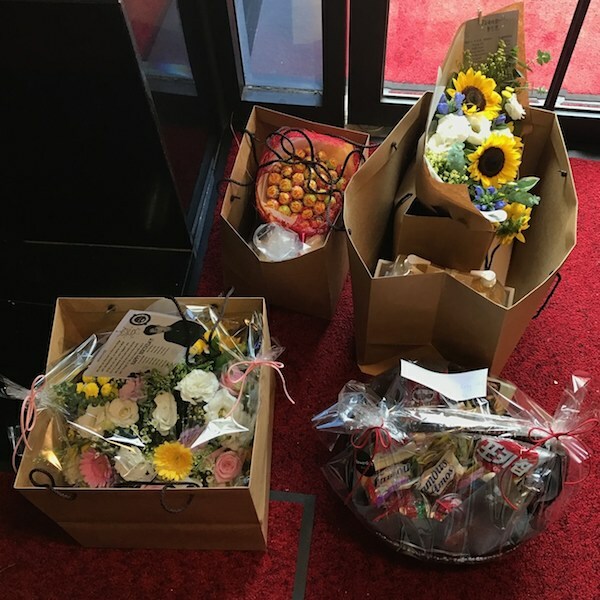 That is a lot of gifts for one member of WANNA ONE! And there were more inside YMC Entertainment! 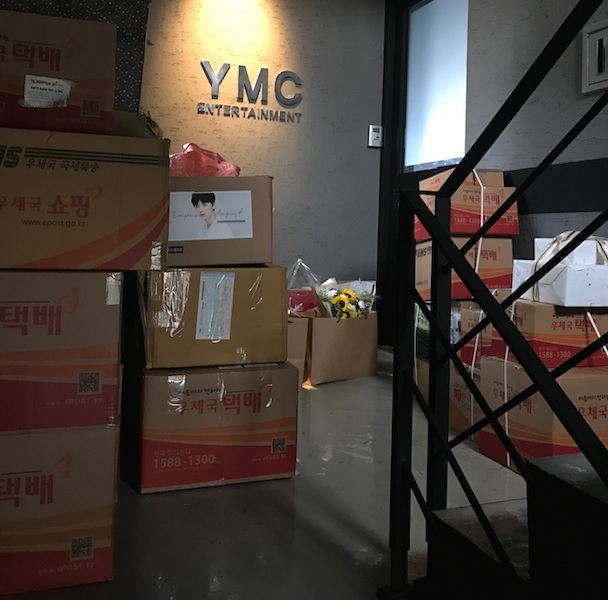 So, we were able to deliver the gifts to YMC Entertainment and took some photos, which was not easy to do. It was fun preparing and delivering the gifts for our customers. They were really happy to have received our photos and knew for sure that we delivered the gifts to YMC Entertainment in Seoul, South Korea to WANNA ONE member Hwang MinHyun! 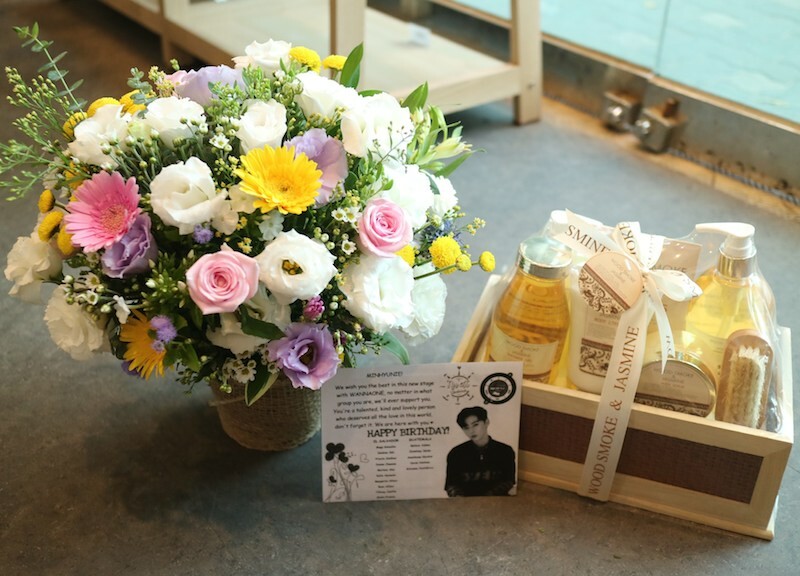 Contact us if you want to send your favorite celebrity in Korea a gift! Actually, YMC Entertainment is only one floor of the building. There are other agencies on the other floors 😊. Hi, how to get there? Can you share? Thanks! How to get to YMC Entertainment? I think it is best to use google maps and it can help you figure out a way to get there. The problem is, the agency is on the fourth floor of the building, and the front door is locked. I don’t know if you will be able to get into the building. It is best to search for Itaewon-dong 36-35 in google maps or whatever map tool you are using. If you go to their website, there is a map on there that shows you where it is. Hi! We actually drove our car there, but you would have to take a bus there as a subway station is not in walking distance from the agency.